Thinking of an idea for your homework project might seem like a lengthy and near impossible task. However, with a little careful thought and some creative planning, this first hurdle needn't be too difficult to scale. Give yourself time to consider your options and you are sure to come up with a fully-formed idea that is developed and imaginative. As soon as you receive details of your homework project brief from your teacher, keep the task firmly in your mind. From daydreaming to rigorous planning, use your spare time to contemplate potential project ideas. Quite often, your best idea will grow from a combination of several others and, as such, will take time to form in your mind and come to the surface. Giving yourself a head start by considering all possibilities from the outset will help to take the stress out of your homework project. Homework projects offer you the opportunity to work imaginatively and creatively. Indeed, you will often be specifically rewarded for creating a project that stands out from the crowd. With this in mind, don't be tempted to borrow the ideas of others or produce anything that it overly similar to the work of another student in your class. If you are worried that you might inadvertently copy others, try to avoid speaking to your friends about your homework projects whilst you are all in the planning stages. This will allow you to focus and come up with an exciting idea that is truly your own. If an idea does not come to you as a result of natural thought, it is time to get your brain into gear. Making use of a visual planning method, such as spider diagramming, will help you to come up with a wide variety of ideas in a short space of time. Get hold of three large pieces of paper and a number of coloured pens. Taking the topic of your homework project, think of three closely related words. Write one in the centre of each piece of paper and draw a large bubble around it. 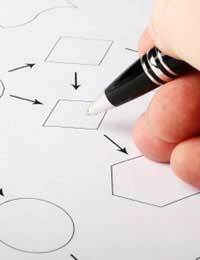 Focusing on one diagram at a time, think of related ideas and words and write these in additional bubbles, connecting them to the centre bubble by drawing lines or arrows. Once you have this basic map draw out, allow your brain to consider all the possible project ideas that the words on the page make you think of. Write all ideas down, don't slow your pace to evaluate each one individually. Once your three pages are complete and packed with ideas, look at each one carefully and pick out a few favourites. Consider what you like and dislike about each one. You might find that you are able to merge aspects of several ideas to create one big idea. Once you have decided upon your idea, if you have the time, it is better not to immediately launch head on into the detailed planning stages. Give yourself a while to mull over the basic framework of your idea over and make any changes that you might see fit. Remember that, at this stage, your idea is still flexible and you are still able to make any amendments or improvements that seem appropriate. In this way, thinking of a homework idea should be a thoughtful and gentle process, as well as an enjoyable one.